During my recent trip to Melbourne I was finally able to take a trip to Chadstone and indulge in High Tea at Ladurée with my lovely friend Aneta, and it was nothing short of wonderful! I have to say, I was a little skeptical considering the café doesn't have an onsite kitchen so I thought that the food would be a little so-so, but I was pleasantly surprised by just how fresh everything was. The tea came with three tiers of delicious treats. 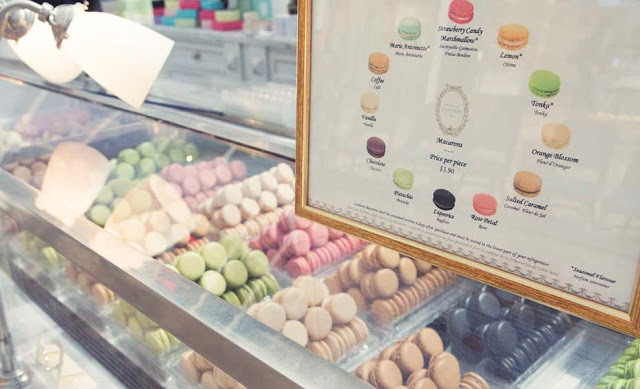 Beginning with crisp apple and cucumber finger sandwiches, followed by deliciously crumbly petite madeleines, and finished with a selection of macarons; three choices each. I know that everyone gripes about how expensive Ladurée macarons are because they're all made overseas and freighted into the country, but they were without a doubt some of the most delicious macarons I've ever eaten. The shells were perfectly crunchy on the outside, and gave way to a marvellously soft and chewy inner. The macaron flavours I chose were salted caramel, rose petal, and coffee, while Aneta also had the salted caramel, as well as pistachio and matcha. I wish I'd bought a box to take away with me, but of course after hours wandering through the maze that is Chadstone I was totally exhausted and forgot to go back for them! The High Tea also came with a choice of a pot of the cafés special tea blends or an espresso coffee. Aneta chose a pot of the Othello tea, a blend of black tea with a variety of warm spices, while I had a wonderfully rich milk chocolate mocha. I wish I'd been able to take some photos of the café itself because it really is a lovely space, but unfortunately there were always crowds of people in the way, so I've pinched a couple from Google to illustrate. It's right in the middle of a big atrium under a glass roof, so on the day we went we were able to eat under the sunshine without getting too warm. 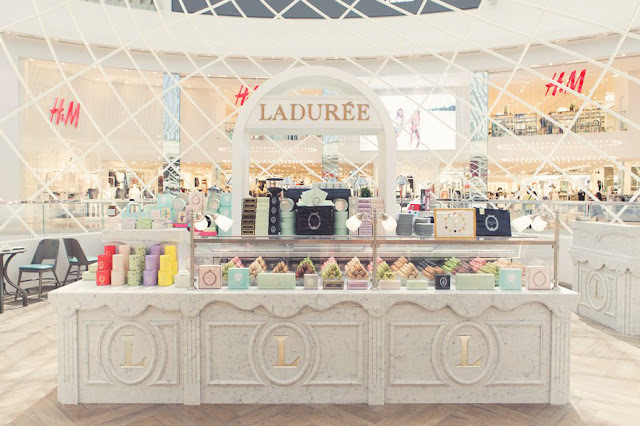 I really loved everything about my trip to Ladurée. The space was very comfortable and breezy, the service was fantastic, and the food definitely exceeded my expectations, I can't wait to go back on my next Melbourne visit!